Jet-black mirrors meet light cameo devices with this stunning specimen. Mirrors are free of haze and hold no distracting blemishes plus incredible depth rarely found on a 1951! 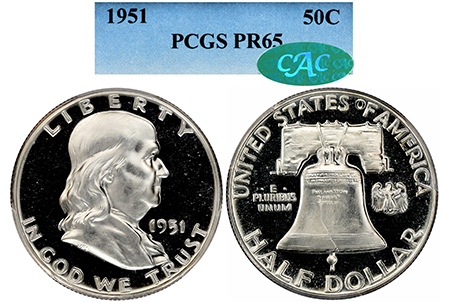 Franklin is lightly coated in snow that just barely misses the Cameo grade, while the Liberty Bell is a flown blown Cameo. A truly superb 1951 Franklin!